The GO UNO and OKI C831-TS LED laser transfer printers are versatile, affordable solutions for digital decoration of garments and rigid substrates. Digital decorators with varying levels of experience are discovering the unique benefits of laser transfer and self-weeding papers. As with any digital transfer process, there are a few tips and tricks that can make the difference between a long learning curve and a quick start to success. When there are orders to fill and things aren’t going right, a simple thing like a T-shirt transfer can seem like scaling Mount Everest. To help you move those mountains, we offer these laser transfer troubleshooting tips. EnduraTRANS FHC is our one step, self-weeding paper for white, gray, and pastel shirts. It’s great for high resolution photo quality images on cotton, polyester, acrylic, and blended garments. It comes in packs of 100 letter size and 11″ x 17″ sheets. The process is pretty simple. You design your graphic, print it on FHC paper using the correct settings, then heat press it to a garment. Removing the paper from the shirt leaves only the toner as the image is ‘weeded’ during removal of the paper. Then stretch the shirt and repress for 25 seconds. For more details, please view section five of the GO UNO Webinar on SignWarehouse TV. Although it’s not a complicated process, there are a few things that can go awry. Tacky or pinkish residue: Sometimes your transfers will have a tacky feeling to them. Cotton shirts may feel sticky, polyester shirts may feel tacky and have a slightly pinkish hue. This is caused by excessive heat. Reduce the temperature on your heat press until this goes away. The recommended temperature is 345°F. Check your heat press to make sure the displayed temperature setting is the actual platen temperature. Unless you’ve already calibrated it, it may be off by as much as 20 degrees. Here’s how to check it and calibrate it. Cracking or fading transfers: Some customers have complained that their transfers crack after being applied to the garment, or that they wash off. Both of these problems are caused by skipping the following repress step: After peeling the FHC paper, always stretch the garment, then cover it with silicone paper or a Teflon sheet and repress for 25 seconds. This bonds the toner with the fabric, and makes the applied transfer flexible and wash-fast. For detailed application instructions and more troubleshooting tips, please click here to view or download the PDF. Decorating dark garments requires a self-weeding paper that works in two stages. The two-step solutions that work with the GO UNO, OKI C831-TS, and other CMYK laser printers are the Neenah Image Clip Laser Dark, and Forever Laser Dark (No-Cut) Low Temp. These products include two sheets of paper; an imaging sheet and a transfer sheet. Design your vector graphic (without any white or pastel hues) and print on the imaging sheet. Then press it face to face with a transfer sheet. When the sheets are separated, the transfer sheet gives and takes. It takes away the un-printed polymer coating from the imaging sheet* and adds an adhesive coating to the toner that allows it to stick to the garment on the second step. The second step is the pressing of the printed toner to the garment. For more detailed instructions for Neenah Image Clip, including a video demonstration, please refer to section five of the GO UNO Webinar. Forever Laser Dark details can be found here in our recent blog article. Since dark shirt transfers involve two steps, there are a few more troubleshooting tips to mastering the process. Here are the top three. Too much pressure can cause incomplete transfers with Neenah paper. Fig 3. 1) Incomplete weeding on step one: If you get an incomplete transfer when you separate the imaging sheet and transfer sheets (See Figure 3.) , there are two possible causes. Heat Loss: you’re most likely letting the paper cool too quickly. The best way to avoid this is to close the heat press for a couple of minutes before you press the imaging sheet and transfer sheets together. This pre-press cycle warms the bottom table so that it’s not pulling heat from the paper during the separation step. The paper stays warm as you separate the sheets resulting in a more consistent transfer. This step also works with Forever Laser Dark (No-Cut) Low Temp transfer papers. Keeping the press table warm is THE most important step to obtaining a clean transfer and even coating on this first step with all two-step laser transfer papers. Pressure: If you’re doing this, but still getting uneven transfers – or if all the toner is transferring from the imaging sheet to the transfer sheet- you’re using too much pressure. This step requires only medium to light pressure. Reduce it moderately until you get a clean separation with no toner on the transfer sheet, and a solid white base of polymer applied to the bottom of the imaging sheet. 2) White lines on final transfer: If, after pressing the transfer to the garment (step two), you have traces of white on the shirt where the edges of the paper were, ( Figure 4), there are two possible causes. Transfer Sheet Residue: Pressing and peeling the imaging and transfer sheets usually leaves a line of residue from the imaging sheet on the transfer sheet. This is the case with both Neenah and Forever Laser Dark products. Always trim the edges of the imaging sheet before pressing it to the garment. This will remove the inevitable line of polymer left from the edge of the transfer sheet on the imaging sheet. Pressure: If you’ve trimmed this and you still end up with a white line on the shirt, you’re using too much pressure. Although the second stage requires more pressure than the first, overdoing it can crush the edges of the transfer paper causing it to embed itself in the fabric. This is a Neenah problem that doesn’t apply to Forever Laser Dark because the Forever solution uses a transparent foil. If your Neenah transfer does this, you can carefully scrape off the residue with an art knife, but it’s better to simply reduce the pressure a little and avoid the problem. 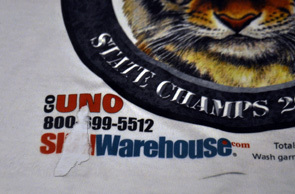 3) White residue on shirt after removing: If, you’re using Neenah Image Clip Laser Dark and you have a field of white residue under the entire area of the transfer after removing the paper, you’ve waited too long to peel it. The manufacturer’s instructions direct users to let the paper cool to room temperature before peeling it. But, in our experience, this always results in a grainy residue on the fabric. Our best results have been obtained by starting to peel the transfer 30 seconds after the end of the heat press cycle. For detailed application instructions and more troubleshooting tips, please click here to view or download the PDF. You can also use laser transfer printers to decorate hard surfaces like ceramic tiles and mugs, using EnduraTrans HS2 (Hard Surface) paper. (Mouse pads can be decorated using EnduraTrans FHC paper just like a white T-shirt). This is similar to the process for sublimating ‘blanks’ with a notable exception. The laser transfer process doesn’t require a polymer coating. So you can decorate un-coated items like magnetic sheeting that can’t be sublimated. 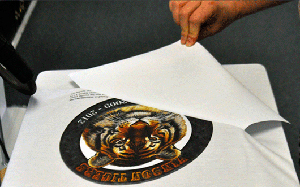 Unlike the transfer papers for apparel, the suggested time, temperature and pressure settings for decorating hard surfaces vary depending on the substrate. Time and temperature settings for supported substrates are on the downloadable instruction sheet. Speaking of hot peel processes, here’s the final tip for all applications and papers. Wear gloves! Some applications, like separating the two-step dark garments papers, require you to grab and peel paper when it’s still quite toasty. Wearing heat resistant gloves will help reduce hesitation and result in cleaner transfers. Simple cotton gardening gloves with grippy textured rubber palms work wonderfully. Of course, if you’re going to re-purpose gloves you’ve been using to plant gardenias, make sure they’re nice and clean. Laser transfer is a simple and versatile process that gives creative entrepreneurs new ways to decorate garments and gift items–and make lots of money. But even simple processes can seem like mountainous challenges if you don’t know the tips and tricks to solve common problems. Following these laser transfer troubleshooting tips will turn any issues you encounter from mountains into mole hills.